The lodgings at Iron Creek hit a new low point on the trip, but at $50 Canadian (about $30 US) it's hard to complain. It's also the only facility without riding the next 35 miles into Watson Lake, and we were all tired, so we fight off the thousands of mesquitos, grin and bear it. Although not without complaining I might ad. We're so happy to leave Iron Creek, we are all up by 7 am and on the road by 8 am. That's a first for us, and we pretty much ride together into Watson Lake, where we have breakfast and fuel up. The scenery is uneventful, with wide vistas of northern forest and mountains in the background. 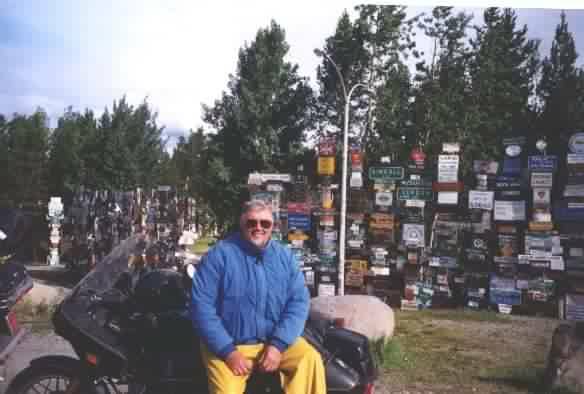 Me at the Watson Lake sign forest. City name signs from all over North America can be found here. The bikes and riders are all doing well. Julia's Truimph is brand new, with Eric's only a year old. They are in pristine condition and require nothing more than being washed occasionally, the oil level checked and the chain lubricated. In motorcycle parlance they are known as "sport tourers." They are designed for a trip like this and perform as expected. Eric and Julia are both experienced riders and when necessary, can cover long distances at high average speeds. Lack of seat comfort is the only fault I suspect with the Triumphs, and Eric and Julia take a break at least every 70 miles. It will be interesting to see how these bikes perform on the gravel Dalton Highway, although they have appeared to do well on the many miles of gravel construction we have encountered. Randy is riding a KLR. It's a 650cc single cylinder Kawasaki, made for both on and off-road use. It's known as a "dual-sport." Randy has ridden since he was a kid, although I think he has just recently gotten back into riding. He is an excellent and experienced rider. The bike is capable of doing 80 or 90 mph if necessary, although we rarely exceed the posted speed limit of 100 kph. Other than perhaps Jan's BMW combination, Randy's bike is most suited for the 800 miles of gravel of the Dalton Highway roundtrip. We agree to stop at Swift River for lunch, but with our early start it is only 11:30 am, and we've already covered 130 miles. The road has a good surface and is straight, and we are making good time. We agree to go on to Teslin Lodge for lunch, another 70 miles down the road. We ride pretty much together, although at times I believe we are spread out over five or ten miles. I stop to add my rain jacket, and it takes me twenty miles to catch Jan, who has stopped to wait for me. We chat with Eric and Julia at a rest stop, and pass and re-pass Randy as he stops to take pictures and change riding gear. 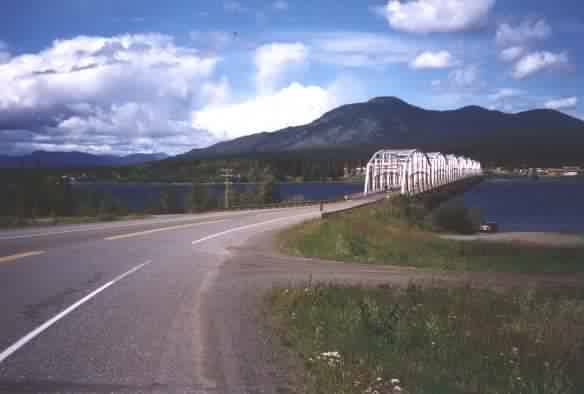 The Alaska Highway crosses Teslin Lake -- 100 miles south of Whitehorse. The weather is cloudy with occasional sun breaks and frequent and sometimes intense short showers. Today we have ridden with our raingear on most of the time, then the sun comes out and it gets so hot you have to remove a layer. By late afternoon I have full rain gear on, but it's warm enough I'm getting sleepy. That's not a good thing on a bike, so I take my face shield off to get some cold air. I need to be sharp and attentive to complete this ride. We ride for an hour past Teslin Lake and then Marsh Lake as we head for Whitehorse, with the near peaks of the Coast Mountains just to our left. We are in The Yukon Territory now, and it is remote and beautiful. Quite simply, the scenery is overpowering. I drink it in, but also understand that we will enjoy similar views for most of the next three weeks as we tour Alaska. We have arrived in Whitehorse. Jan and I have ridden over 1,800 miles and are more than half way to Prudoe Bay. Life is wonderful.